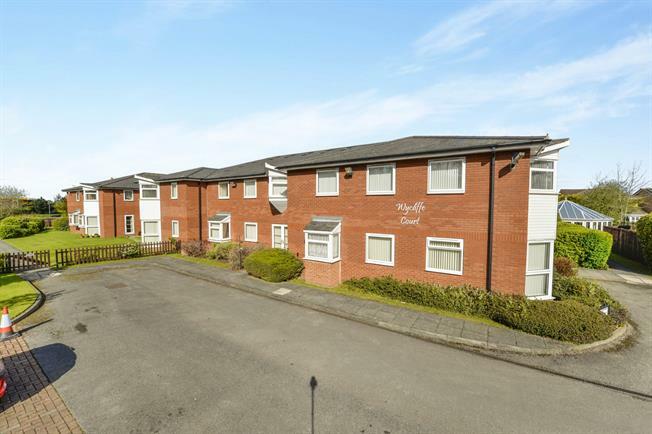 1 Bedroom Flat For Sale in Yarm for Asking Price £95,000. Presented immaculately, and offered fully furnished if required. The spacious living room faces west, and has three windows to the rear and side, all with views over the attractive communal gardens. Comprising of a living room with dining area, kitchen, double bedroom, bathroom and entrance hall with two large storage cupboards. The complex offers two communal lounges, a large conservatory and gardens for residents and guests to enjoy, as well as plenty of parking. A spacious entrance into the apartment, with doors leading to all rooms. Two storage cupboards. This charming room faces west, and has two windows to the rear, and one to the side, all with lovely views over the gardens. Light and bright, with plenty of room for a dining area as well as lounge. Ceiling light, coving and electric radiator. Fitted with a range of white wall and base units. Integrated double oven and hob, free standing washing machine, fridge freezer and microwave oven. Wall mounted heater. Ceiling light. Window to the side with views of the gardens and conservatory. Window to the rear facing west. Electric radiator. Ceiling light. A light coloured three piece suite comprising of a panelled bath, pedestal wash hand basin and low level WC. Wall mounted heated towel rail. Ceiling light and extractor fan. Tiled walls. Fitted with shelving and a hanging rail, this large cupboard is a useful storage area. Containing the central heating water tank, and provides space for extra storage. There are several informal seating areas for residents and guests to relax, facing the rear gardens and enjoying the afternoon and evening sun. A large conservatory offers further space to admire the gardens, and meet neighbours and friends. The communal gardens wrap around the apartments on three sides, and offer several areas for resting to enjoy the flowers and wildlife. Mainly laid to lawn, with several mature trees and shrubs and flower borders. A car park to the front provides ample parking for residents and visitors.